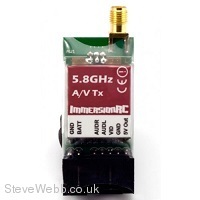 The solution to your 2.4GHz radio gear incompatibility issues - 5.8GHz video gear from ImmersionRC! The product will accept an input voltage of 6-25V (2S-6S) and includes a sophisticated switching regulator to power itself and your 5V camera cleanly and efficiently. 5V camera power, ideal for a KX131/ SN555, is generated on-board. High bandwidth stereo-audio channels, ideal for sending down high-speed telemetry data. 5.8 GHz transmitters which operate above 25mW may require an Amateur Radio Licence in your country. Please check with your local radio authority before use. Nb. Never power up a transmitter without the antenna attached. This will damage the transmitter.